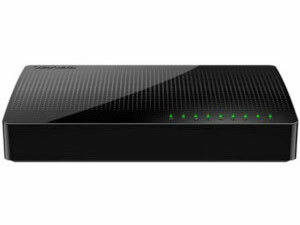 It has eight (8) 10/100/1,000 Mbps auto-negotiation ports, with which to establish a LAN network. It features enhanced transmission speed and eliminates possible transmission bottlenecks. It is easy to use and ideal for school dormitories, small offices, home offices and video surveillance. Ports can automatically identify the parallel line and intersecting line without pertinent setup. Can be used directly when your line is connected, without special setup.